The Director-General of the Osun APC Campaign Organisation, Professor Olusola Adeyeye, has said that the Governor of the State of Osun, Rauf Aregbesola, has shown, with his performances, that he is the best thing ever to happen to the state. He was on Politics Today on Channels Television, where he enumerated several developments in the state as it prepares for its governorship election slated for August 9, 2014. He said that the evidence of a serious governor had become noticeable right from the boundary of Osun with Oyo State, as the quality of life has generally improved for the citizens of the state. With emphasis on the youths of the state, he noted that as regards employment, the Governor has been able to create a scheme that is better than the National Youth Service Corps (NYSC) by engaging the youths in jobs that are beneficial to the environment and by paying attention to training and development. 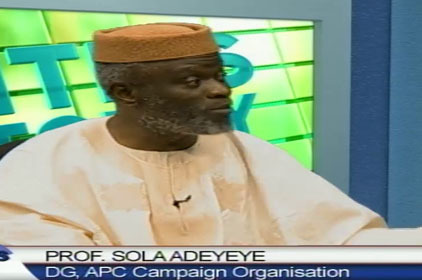 In response to critics, Prof. Adeyeye also defended the Governor’s decision to change the nomenclature of the state from the regular Osun State to ‘The State of Osun’, claiming that the decision to stand out was the beauty of federalism. There had been the impression that the citizens of the state were not consulted in the decision to rearrange the name the state, but he debunked the claim, insisting that the people of Osun were overwhelmingly in support of their Governor. He added that those criticizing the re-branding move were only chasing shadows. Having recalled that the launch of the Osun flag was also criticized for having a cowrie, he said that any criticism of the ideas of the Governor, or a demand for change would only be valid if it came from the citizens and not from mischief makers, who while covering their own acts of idolatry, have decided to “demonise” the Governor, who is a devoted Muslim promoting the state’s culture. Adeyeye believes that based on his performance in the State of Osun, Governor Aregbesola deserves to be scored 95% . “You judge a man for what he has done by the magnitude of his resources”, he said, explaining that without being an oil producing state, the development in the state has been unprecedented. He also took a swipe at President Jonathan for promising during campaigns to help states when they vote for his party. He condemned the statement which he said implied that he (President) would only develop states governed by the PDP. On education, he noted that prior to the governorship of Aregbesola, Osun State had been in the last position in the country based on the performances of its students in NECO exams, but by 2012, one year into his leadership, Osun placed 18th, and in addition to this, he has also achieved a 62% increase in primary school enrolment in the state. The Professor of Biology also provided explanations for the state’s widely criticized inability to pay its workers’ salaries at some point. He gave an insight into the financial challenges of the state and how the Governor was able to resolve the challenges. Opon Imo, which is the state’s attempt to use Information and Communication Technology to enhance the learning process in its schools, has been alleged to be a scam for having an 80% error rate, leading to its withdrawal, and Prof Adeyeye said that this was a lie. He revealed that the tablet, which was given the indigenous name, Opon Imo, was a digital device that contained a compilation of educational books by Evans Publishers and if there were errors in the printed version of those books they would be carried into the digital form and this should not be blamed on the State Government’s idea. He went ahead to explain the rationale behind the Governor’s efforts in the education sector, especially the restructuring of schools in the state, which included the nonavailability of enough teachers for important subjects and this necessitated some mergers. He also debunked allegations that the contract for the Osun schools uniforms was executed by the wife of the Governor. He explained that a Lagos based company, Sam and Sarah, handled the contract because they provided the best bid and showed the capacity to do a good job. He revealed that the company also got some funding from the Bank of Industry to execute the project and this led to a branch of the company being built in Osun State based on the Governor’s insistence that the project must benefit the state by way of creating jobs for the citizens. He added that the company remained 100% owned by its original owners and has nothing to do with the wife of the Governor. He maintained that the allegations against the Governor were baseless as all he had done was in the interest of the people. On Governor Aregbesola’s manifesto for his re-election bid, Professor Adeyeye stated that the Governor’s vision for the second term was a complete transformation of the education sector, the development of a new Ile-Ife town and more infrastructural development for the people. He promised that by the time the Aregbesola leadership rounds off its second term, the state would have experienced a total transformation.